aquaTIGHT® prevents the penetration of liquid water through cements, grouts and stones by transforming the surface of every grain into a water-repelling, hydrophobic barrier. 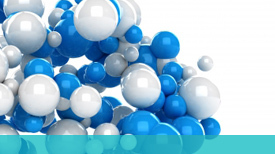 aquaTIGHT® is not a polymer; it is a unique solution of chemicals that bond molecularly to calcium, aluminum, magnesium, and other ions on the surfaces of stone and cement. aquaTIGHT® prevents the penetration of liquid water. However, unlike polymer films, aquaTIGHT® does not impede the evaporation of liquid water that may be in or below these surfaces. All cementitious formulas, i.e. mortar, grouts, and thinset, are composed of grains bonded to each other, with pores between the grains. The same applies to stones such as marbles, granites, slates, and clays (fired and unfired). The grains themselves are hydrophilic, which means they have a low contact angle on contact with liquid water and consequently attract liquid water. As a consequence liquid water wicks into and throughout the material. (Unsanded grouts and cements have a finer grain structure than sanded material, and thus have a slower rate of wicking). aquaTIGHT® works by tightly bonding a phosphonic acid functional group to the metal ions present on the surface of the cementitious grains, and then aligning a hydrophobic (water-repelling) tail away from this surface. 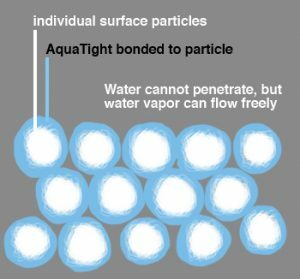 As adjacent ions react with other aquaTIGHT® molecules, a compact surface is created where the hydrophobic tails align with each other to present a uniform, water repelling surface. This water repelling surface naturally has a high contact angle with liquid water; hence water droplets on the surface bead up rather than soaking in. At the same time, the hydrophobic surface does not interact with water vapor, so that evaporation of water is not retarded, as it would be if a polymer film were present. Thus aquaTIGHT® prevents liquid water from entering treated surfaces, but does not prevent its evaporation from those surfaces – the best of both worlds. 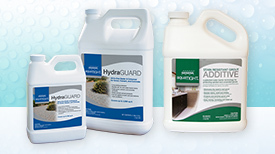 Unlike other sealers, aquaTIGHT® does not use any polymers, acrylics or silicones. aquaTIGHT® is different in that it actually seeks out to find those pores and then locks them tight. 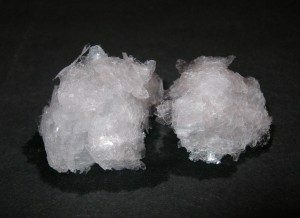 The pores are locked tight through a natural crystallization process. The accompanying image shows the bonding to the calcium and metal molecules. Water molecules can’t penetrate past the hydrophobic surface of the active ingredient, preventing them from reaching the surface of the tile/grout, thus making it a grout with sealer within. Most sealers leave a film on the surface which can be scratched off. Once this film is scratched off, water can then saturate deep inside and underneath the surface. This breach can cause severe damage to the underlying structure.